If you are planning to organize a celebration, conference, seminar or presentation, planning administration meetings or job interview in Liepaja, hotel Europa City Amrita will offer most appropriate and modern premises for successful event. By taking into consideration planned type of event and the number of participants Europa City Amrita offers several conference rooms. Conference centre Jacob’s Hall at the same time is able to accommodate up to 170 participants. The facilities are equipped with all the indispensable things for successful conference - appropriate lighting, multimedia projectors, screens, whiteboards, stage and pulpit (on request), air conditioning, synchronic translation booths, etc.. If you plan to measure a smaller number of participants, Jacob’s Hall can be used as two separate conference rooms – Jacob’s Hall 1 and Jacob’s Hall 2, which are separated by a sound-proof, sliding wall. Jacob’s Lobby which is located next to the Jacob’s Hall will be suitable for the planned coffee breaks, lunch and dinner, as well for the presentations and discussions. Jacob’s Lobby and Jacob’s Hall together can accommodate up to 220 visitors of the event. The luxurious and sophisticated Banquet Hall will be suitable for seminars (up to 32 people) as well for business or solemn lunches and dinners, while the Club hall - for seminars, presentations and discussions (up to 40 participants). 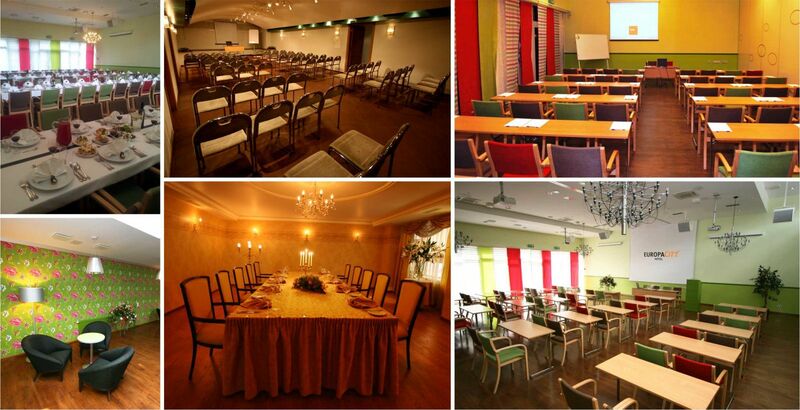 Conference hall which is located in basement is suitable for seminars and conferences for up to 100 people. Restaurant Oskars is suitable place for special celebrations - weddings, birthday parties or other special events in sophisticated atmosphere. At the customer's request, conference rooms are provided with all needed equipment for successful event - writing materials, whiteboards, microphones, multimedia projectors, screens, hardware, or synchronic translation equipment. The restaurant Oskars will ensure coffee breaks, lunch and dinner serving for conference members. If You are planning to organize celebration or conference at hotel’s “Europa City Amrita” premises, we are pleased to offer a very special discounts for hotel’s accommodation services on the day of celebration or conference. Choosing to organize a celebration or a conference in four-star hotel Europa City Amrita, you will be provided with the best service, according to hotel’s category and high quality standards.